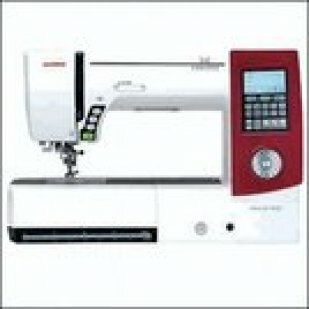 Janome Horizon 7700 QCP This is truly the ultimate sewing and quilting machine. Janome has taken everything that sewists love about the Janome 6600P, added the features they've always wished it incorporated (and thrown in a few more for good measure), and created what will become the most coveted machine in the sewing world! The Janome Horizon 7700 QCP boasts a free arm, 11" of work space (the 6600P has 9"), and automatic plate converter for straight stitch sewing, Accufeed, 250 stitches, high visibility LCD touchscreen, speeds of 1,000 stitches per minute, 5 ultrabright LED lamps, Superior Plus Feed System - and sew much more! Remember when you caught the sewing and quilting bug? Bet you never imagined how far your new love would take you. A few fabric pieces here, a straight stitch there, soon you were creating all kinds of beautiful things that were uniquely yours. Suddenly, nothing in the world was more fun than fabric and thread. And now, each new project is like an exciting trip you can't wait to take. It's been a journey at Janome as well. People brought home the first sewing machines and watched in awe as a task that would have taken hours or days to finish by hand was completed in minutes. With the Horizon, every new feature and function is based on nearly a century of design and technological advancement, resulting in what we believe is the ultimate sewing and quilting machine. You can tell the moment you sit down in front of it. You have plenty of room to stretch your creative muscles. Controls are positioned where it makes the most sense for hours of enjoyment. Operation is instinctive- the icons and buttons are easy to use and understand. And of course, the Horizon is a true Janome where it matters most: the quality of your stitches. The new Quilt Piecing System is an amazing synergy of precision. It moves thick layers of fabric and batting past the needle with ease, allows you to stitch from the tip of a point without a starter piece, and gives you the controls to maintain a perfect 1/4" seam from virtually any angle. It opens up new possibilities for your creativity. From the widest bed in its class to the most illuminating lighting system. It has speed, precision and an innovative navigation system that makes it a breeze to choose your stitch out of the 250 available. Thousands of hours of experience, technology and testing stand behind this machine. But when you're working with your new Horizon, you won't give it much thought at all. You'll be lost in the enjoyment of your next journey, knowing how you get there makes all the difference. Enjoy The Wide, Wide World! Go ahead, make that big quilt, elegant draperies or elaborate wedding dress. With 11" of work space to the right of the needle and nearly 5" in vertical clearance, the Horizon gives you plenty of room. And that makes every step of large project construction so much easier. You have more room to maneuver when piecing, more room to accommodate your final quilting, more room to manage big home decor projects, like slipcovers and window treatments. There's more of everything, including more value! You get all these features for one of the best prices on the market today. Find out how affordable it is to bring a Horizon into your home. Underneath the sleek exterior is Horizon's highly rigid aluminum frame, which is what allows the machine to have a very long arm yet still create such precise stitches (all 250 of them). The Quilt Piecing System: Working Together So You Can Relax. Its name refers to quilting, but it's crucial for all types of sewing. The Quilt Piecing System is an interconnected set of four features that produces perfect, precision stitching. Automatic Plate Converter: Select a straight stitch and the Automatic Plate Converter (APC) changes the size and shape of the needle hole. When the needle is going up and down in a single spot, the needle plate operates best with a single small, round hole. This is especially important when you're using light fabrics, stitching at high speeds or doing free-motion quilting. Your fabric won't be pulled into the needle plate; it stays flat and smooth. The APC was specifically engineered to improve free-motion quilting. We're so sure you'll love it for this technique, we include the popular Convertible Free Motion Foot Set as part of the standard accessories package. Plate Markings: Sewing, and especially quilting, is all about precise measurement. The comprehensive markings on the Horizon's needle plate and bed give you extra precision when and where it counts - right on the plate as you're making your stitches. You'll find markings on both sides of the needle for seams of all sizes. There are also special angle marks, cornering guides and needle drop lines. Superior Plus Feed System: The 7-piece feed dogs of the Superior Plus Feed System (SFS+) move parallel to the needle plate and in unison as they pull your fabric past the needle. This exclusive Janome design, sometimes called a box feed, increases the surface area in contact with the fabric. Combine this with the professional-grade good pressure, and the thickest canvas to the thinnest silk is fed without slipping or shifting. AcuFeed: When it's time to move a lot of layers at once, our AcuFeed System literally pulls it all together. With a wider stance and a more even pull, the AcuFeed foot feeds your top layer(s) of fabric past the needle in precise, parallel coordination with the bottom layer(s). Matching plaids and working with difficult fabrics, like laminate and suede, is frustration-free with AcuFeed. Easy To Find And Easy To Choose You get so many stitches and functions with the Horizon, you really need a fast and easy way to find them all. How about TWO ways. Take the Jog Dial for a spin to move quickly through your stitch choices. It's an actual rotating wheel with a nice tactile feel that gives you quick, precise control with your finger tip. Rotate forwards or backwards, then simply press the middle button to select. Or, choose the backlit, high resolution LCD screen, which displays your stitch options in crisp, clear characters. You can use either a stylus or your finger on the highly responsive panel. A light touch is all it takes to make your choice. The Janome Horizon 7700 QCP will be available for purchase In-Store Only. Contact Absolutely Fun Sewing & Embroidery at 615-295-2998 for information on this exciting new machine.